It may be mentioned here that the monument was badly damaged and set on fire by an angry mob in 1992 in retaliation to the demolition of the Babri Mosque in India and at that time the people had taken its precious wooden doors, as informed by the locals. Baradari of Maharaja Sher Singh is located in the area known as Kot Khawaja Saeed in Southern Lahore. Once river Ravi flowed here and the Baradari of Shah Bilawal was on the bank of river. There was time when this residential complex of Sher Singh was surrounded by the Sikh garrisons to protect the Raja. At present the building is in the midst of the urban population and all types of developmental pressures are playing their role in tarnishing its original setting and integrity. The feasibility report of Archeology department said that if proper steps would not be taken to preserve it, the Baradari would be vanished completely. There is dire need of urgent attention to put the building into sound structural repairs, so as to preserve it for the posterity. The monument is in very dilapidated condition besides its environmental integrity and its setting in prevailing circumstance is highly at stake. The building is full of settlement and cracks and some of the walls are out of plumb. The walls of the building require attention, pointing and resetting of loose bricks. The structure, after the death of Sher Singh was left at the mercy of time, doom and devil and great deal is needed to be carried out towards arresting its further decay. An integrated study of various architectural, structural, decorative and environmental issues at present are adequately needed to keep this monument as an element of the historic urban part of the city. Architecturally this building does not hold any distinct pretensions among the Sikh built heritage of the area but its historic association with the period is above board because of the tragic end of the Maharaja Sher Singh. The locals have a story that Sher Singh came here to inspect the troops in 1843. His General Sardar Ajit Singh Sindhanwalia presented him a gun and pulled the trigger when Maharaja was about to hold the gun. He died on the spot. Lehna Singh Sindhaalia killed his seven or nine year’s old son, Kunwar Partab Singh, simultaneously. Their bodies were cremated at the same place and later on their Samadhs were built here. This entry was posted in Architecture, heritage, Lahore, Minorities, Sikh period and tagged Architecture, heritage, Lahore, Lahore Heritage, sher singh baradari, sikh era, Sikh Period. Bookmark the permalink. This area was called by Shah Bilawal Baradari, nearest to this place was Bagh Teja Singh, where Sher Singh’s son Partap Singh was killed. 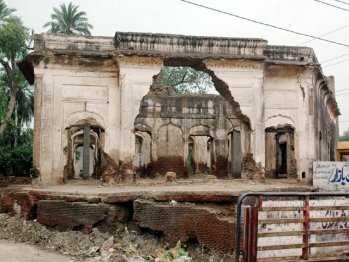 Even the Historical Palace of Maharaja Sher Singh situated in the city of Batala, Punjab India is in bad condition, not being repaired by Archeological Survey of India.